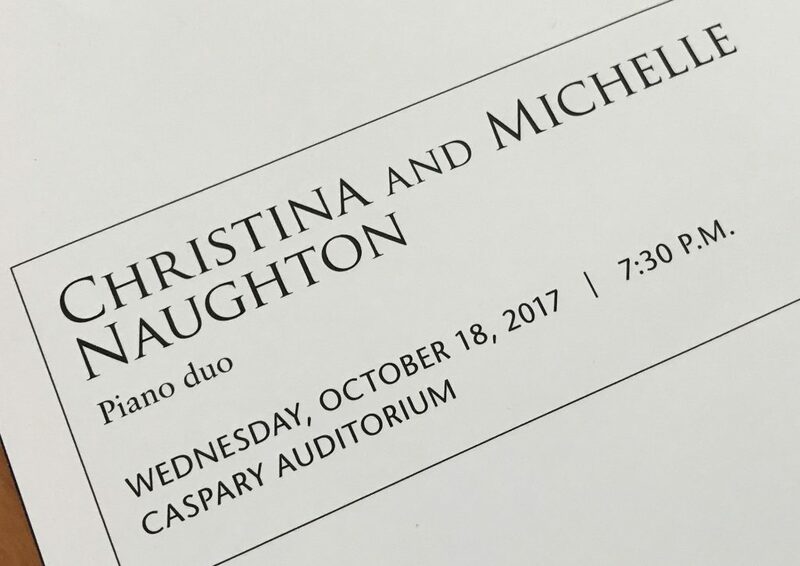 Are we at risk of betraying an infatuation with the playing of Christina and Michelle Naughton? After all, they provided our first interview and were the subjects of one of our first reviews. But how could we resist writing a note about so memorable a performance as last Wednesday’s at the Caspary Auditorium at the Rockefeller University, that edifice of scientific advancement. The Caspary is a venue certainly designed by a scientist, or by an architect aiming to appeal to the scientifically minded. Odyssey-white, with an enormous circular portal behind the stage, the Caspary gives the feeling of preparing for space travel, the spherical interior strengthened for retaining atmospheric pressure against the outside void. The stage, possessing no wings but instead a small portable partition at the left, brings to mind a specimen tray. The spotlights trained on the two Steinways illuminated only the fronts of the keys, casting the rest in shadow. The Naughtons sat together at the piano at stage left, and as they began the Mozart four-hand variations, I felt a complete depressurization, not a loss of air but of tension and cares, these replaced with tranquility. And tranquility was then replaced by wistful joy as they continued with the Ravel, and by thrills with the raucous and exuberant Schoenfield, their hands, flashing in and out of the shadowed area, appearing to be a set of four, as did their feet, clad in identical high-heels, taking turns pedaling. After a brief intermission, the sisters returned, for this segment each at her own piano. Their performance of the Debussy was mesmerizing, and the Rachmaninoff was simply amazing, especially the final movement, the presto Tarantelle, with its blisteringly rapid streams of repeated notes crashing into the violent finale, synchronization epitomized. For an encore, they returned to a single piano for a soothing rendition of Bach’s Gottes Zeit ist die allerbeste Zeit. In 100 years’ time, doubtless science will provide abundant identical copies of beautiful and skilled neo-human performers who, in unsurprisingly perfect synchronization, can entertain their disease-free, genetically optimized neo-human fellows on the keyboard technologies of the future. Today we have the identical-twin Naughton sisters, products not of science but of nature, talent, and years of strenuous determination, factors which today contribute to making them breathtaking for us. We should cherish them in what may be the last decades where these factors still count.